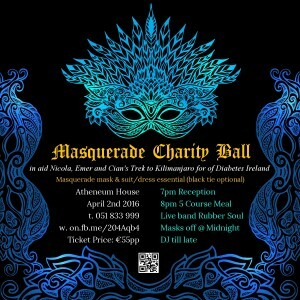 A Masquerade Ball, is taking place in the Athenaeum House on the 2nd of April in aid of Diabetes Ireland. 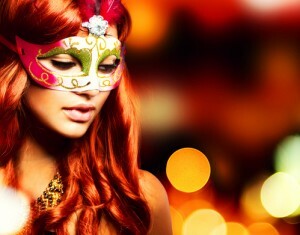 It promises to be an amazing masked ball with a party atmosphere. Grab a glass of bubbly at the door and get that photo op on the selfie photo booth and make all your friends jealous on facebook before settling in for a 5 course meal in an amazing setting. Rubber Soul will entertain until midnight when you can finally reveal your identity and then disco the night away with your besties untill late. Nicola Foley, Emer Croke and Cian Foley are running the night in order to raise funds to take part in a challenge to climb Kilimanjaro for Diabetes Ireland. The tickets are available now from Athenaeum house at 051 833 999 at a cost of €55 with all profits going to Diabetes Ireland. 80 tickets have been sold already and with only 130 capacity it’s important to book early to avoid disappointment. A handy Mother’s day gift idea! Masquerade party’s don’t happen in Waterford too often so don’t miss it! To be in with a chance to win 2 tickets to the ball and a stay over at Athenaeum House on the night+brekkie (worth €200) visit Nicola, Emer and Cian’s Big Trek for Diabetes Ireland facebook page here. This entry was posted in For Charity and tagged Events on January 29, 2016 by Cian Foley.